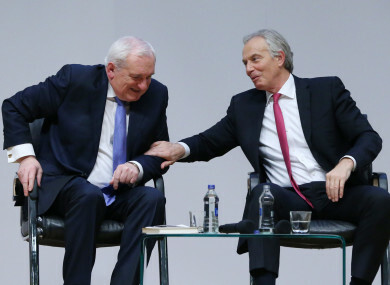 Former taoiseach Bertie Ahern and former Prime Minister Tony Blair at an event to mark the 20th anniversary of the Good Friday Agreement, at Queen's University in Belfast. FORMER TAOISEACH BERTIE Ahern and former British Prime Minister Tony Blair have written a joint op-ed calling for a second Brexit referendum. In the op-ed, published in the Irish Times, they describe Brexit as “the most serious threat to peace in the North and to the union in our lifetime”. The pair open the article by describing how they both signed the Good Friday Agreement in 1998, which sought to bring an end to the Troubles. They say that due to this, they feel “duty-bound” to write an op-ed about their thoughts on the current Brexit situation. Theresa May and her colleagues in parliament “must learn from previous mistakes” and use the newly-approved flextension “to encourage calm amid the chaos”, they say. Over the next six months it is likely that elements within the Conservative Party will seek to oust her and push for a new prime minister to fight for what they call a “proper Brexit”, the details of which have never been spelled out by Boris Johnson or anyone else. Whatever criticisms people may have of Theresa May, her party should reject such manoeuvring. They say that nobody should compare the tragedy of the Troubles to Brexit, “but as the rhetoric becomes stronger, the language more divisive and inflammatory, the divisions in the Tory and Labour parties more evident, the necessity for calm matters even more”. They also write about the need to move behind social media discussions, and of the need to understand the feelings of British citizens. They also say they believe that the Good Friday Agreement will survive Brexit. The pair say there is a time for a “confirmatory referendum” and that “the people of the UK, should have the final say”. They said people should be asked “if now, knowing all that they do, they still wish to proceed, on whatever basis is agreed by government and parliament”. A second Brexit referendum has been ruled out by Prime Minister Theresa May. Last week May was forced to ask EU leaders for a second Brexit extension. It culminated in delaying the last date by which the UK can leave the EU from 12 April to 31 October. Email “Bertie Ahern and Tony Blair write joint op-ed calling for second Brexit referendum”. Feedback on “Bertie Ahern and Tony Blair write joint op-ed calling for second Brexit referendum”.